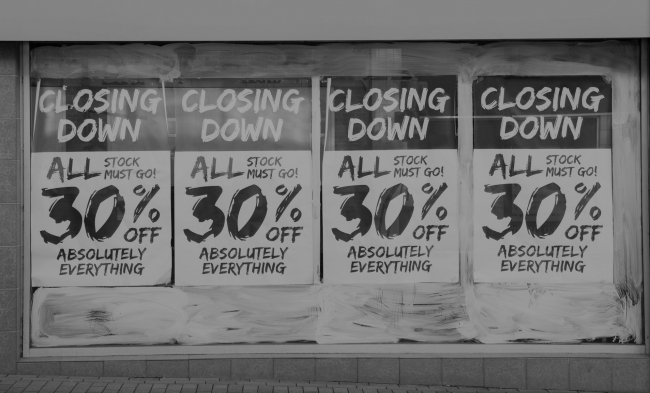 Attributed to the deadly combination of ever-changing consumer behaviour, the current economic pressures on high street retailers, and the lucrative era of e-commerce, retailers are facing mounting pressure to perform successfully on the high-street; resulting in a growing number of retailers sadly falling into administration – leading to an increase in the use of the Company Voluntary Arrangements (CVA) as an alternative to traditional insolvency procedures. Following in the footsteps of BHS, Toys “R” Us, and Homebase, just to name but a few, many more clothing and FMCG retailers, including New Look, Select, Marks and Spencer, and Mothercare are rumoured to be next in line to have no choice but to submit themselves to a CVA, the withdrawal of which implies that these big retailers are all experiencing an overall decline in consumer activity. Several reasons for this increase in pressure on UK retailers include but are not limited to: the weak pound, dynamic shift from high-street retail footfall to ecommerce, remaining pre-Brexit uncertainties, and inflation. Whilst on the surface, CVAs are seen to be enabling unprofitable stores to close, and rents to be reduced, questions have arisen amid concerns about what impact this shift in dynamic bears upon consumers’ traditional high-street spending habits? And more over, whether this change is fundamentally altering the wider-reaching overall structure of supply chains and logistics distribution networks? Undeniably, implications including downsizing operations, and the relocation and closure of high-street stores and distribution centres; all options offered by creditors which appear to be open to restructuring by CVA, means that as long as this realistic remedy remains attractive to retailers, the longer the duration that the overall supply chain will feel the economic effects of these voluntary agreements. The economic outlook for the high-street retail sector continues to remain challenging. In the current climate, CVAs are ultimately being proposed with the intention of saving a company from experiencing administration or liquidation and can therefore be an important step forward for many companies facing insolvency and by proving to be an excellent solution to helping a struggling company become profitable again. Whilst it is suggested that prompt intervention remains essential to maximise the prospect of a successful restructure, it is crucial for advice to be sought early on, by businesses of all sectors which are facing challenges, yet interested in restructuring options such as CVAs. Whilst a CVA could help your business survive, they predominantly exist to serve the restructure of a company’s business, supply chain, and distribution functions included. Yet although CVAs offer the potential option to reduce business liabilities and help with overall profitability, they will not suit all situations, and cannot alone cannot fix a struggling business. Established in 2004, and based in Royal Leamington Spa, the Logistics and Supply Chain Specialists at Gideon Hillman Consulting (GH) understand that companies experiencing a restructure via CVA, are experiencing an extremely stressful period within the running of their business. Highly experienced within, and knowledgeable of the retail, wholesale, and FMCG sectors, if your business is experiencing the threat of restructure, the GH team can support and manage all of your Logistics Network Distribution Planning, and Supply Chain Management requirements from: consolidation, rationalisation, optimisation, to redesigning entire logistics distribution networks.